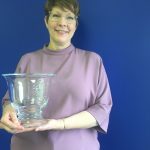 ProKids Executive Director Tracy Cook and volunteer ProKids attorney Tom Cuni, who is also a former board member and board president, recently received honors from the community. This award, named in honor of Jerry Clark, ensures that more children’s lives will be touched, improved and changed forever. Jerry was the driving force in the founding of Insuring The Children. His passion for the mission of Insuring The Children is the reason our organization has contributed nearly $2.2 million to medical and social agencies in the Cincinnati area. 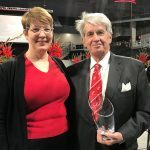 Tom was named the 2019 University of Cincinnati College of Law Outstanding Alumnus. A graduate of UC in 1969 and of the College of Law in 1975, Tom established his own private law practice in the area and was an active member of the Cincinnati Bar Association, including serving as president for two terms. But it was his volunteerism which was noted in UC’s recent recognition. At the CBA, he became familiar with ProKids and joined the board in 2010, serving as president from 2015-17. 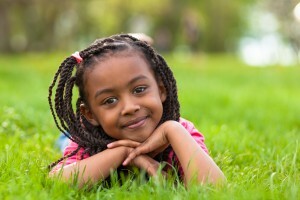 While serving as president, and beginning to partially retire from his private legal practice, he began to learn more about serving as a volunteer attorney for ProKids cases. Since juvenile law had not been his specialty in private practice, he told Tracy that he had great concerns about this area. Tracy challenged him that a child’s best chance of navigating such as system was with his assistance. Tom moved forward, working more than 200 ProKids cases so far and being named Ohio CASA’s Volunteer Attorney of the Year.